This video shows the activity at the entrance of the hive today. 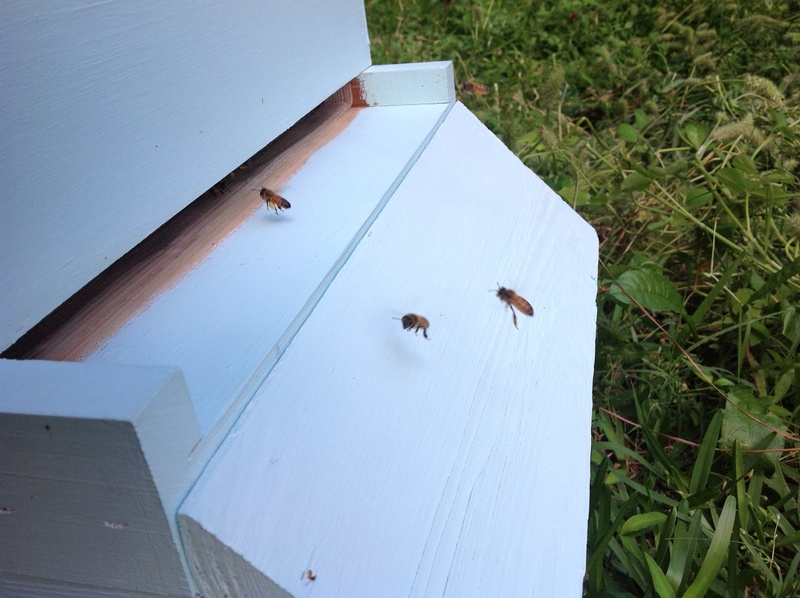 Foragers are actively taking off and arriving while other workers are cleaning the landing. It may look like one cluster of bees are simply hovering over the entrance, but the foragers in that cluster are actually constantly changing. The foragers take off backwards and then orient themselves before jetting off; likewise, on return, they show down just before they land. From a couple of feet away, the bees’ circular ascension before flight looks like a whirlwind. Though the bees have completed this ritual everyday since they have arrived, the sheer number of them in unison at this point seems like a a force of nature. Here’s a picture from Week Three for comparison! Looks like a healthy hive in the making!